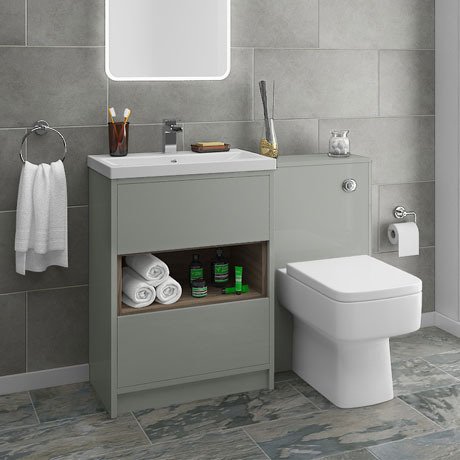 The minimalist Haywood gloss grey and driftwood effect vanity unit and toilet package is ideal for adding a sophisticated touch to any bathroom. Features spacious highly practical soft closing drawers and a stylish single tap hole mid-edged ceramic basin top. The Haywood furniture range is great for creating a bathroom space that is fresh, modern and unique. The open shelf provides immediate access to your bathroom necessities. This stunning floor standing 2 drawer unit will create a focal point in your bathroom as the driftwood open shelf is a great complement to the gloss fascia. The minimalist Haywood gloss grey WC unit comes supplied with a dual flush concealed WC cistern and modern squared design back to wall pan with soft close seat. Vanity unit is available in 2 sizes (510 / 610mm), select size from the drop down menu selection.